Home Main Video News How to Recycle your Old Jeans..
How to Recycle your Old Jeans.. The video shows how to recycle old jeans. Those which are already kept for too long in the closets because nobody uses it already or to small for our children. That instead of letting it rot, the maker of the video - i am sharing you - showed on how to make use of them in a more useful way. It is a very impressive and at the same time very creative product of working ideas. Watch this video. COMMENTS: imsogodsgurl:Love this bag! Thank you for the excellent tutorial! You do such a nice job, I hate it that some people were rude just because the music was a little loud. There are people that appreciate your efforts.Tekneshia: I appreciate you for doing this video because my daughter had to do a blue jeans recycling science project. Worked out great!michelle hill: Brill!! 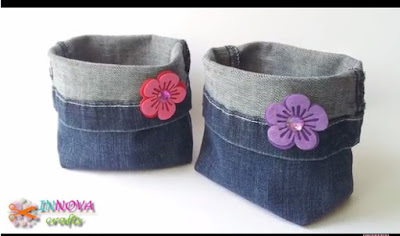 ive had a bag full of old jeans in the cupboard for months wanting to use them for something, definitely gonna have a go perfect for the kids room xxCraftybilliejs:That is so stinking cute and easy. What more could anyone ask for. Thank you for taking the time to share. Your awesome.